To retain our goodwill in clients' consideration, we are trading and supplying an excellent range of Abrasive Cut-Off Wheels. - Used in the construction industry for cutting reinforcement bars. We have a wide variety of ABRASIVE CUT OFF WHEELS. - Spindle Speed 2000r.p.m. and cut-off wheel dia-12". - 7.5HP, 3 Phase Motor. This Heavy Duty Cutting Wheel has a solid, circular shape. We provide a wide range of Cut Off Wheel to our clients, which is ideal for cutting metal, steel, stainless steel, masonry, aluminum and non-ferrous metals. Our range is available in different sizes and thickness. 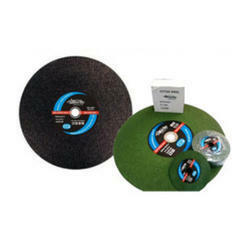 Moreover, our range of Abrasive Cut-Off Wheels is well known for quality, durability and user friendliness. In order to keep pace with never ending demands of the customers, our company is instrumental in presenting excellent quality assortment of Abrasive Cutting Wheel. - Brands like YURI, BOSCH and POLYMAK. 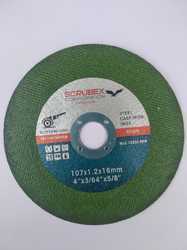 We are reputed suppliers for Abrasive Cutting Wheels that are quality approved by the industry for its superior performance and accurate design. These cutting wheels are made using the latest metallurgical techniques and are precision engineered to suit the area of application to which they are applied.